Not far from High Flying Coffee is Paul Allen’s Flying Heritage Collection, where I went Wednesday morning for a sneak peek at the museum’s latest wartime artifact, a World War II tank that will be unveiled during a Memorial Day event on Monday. 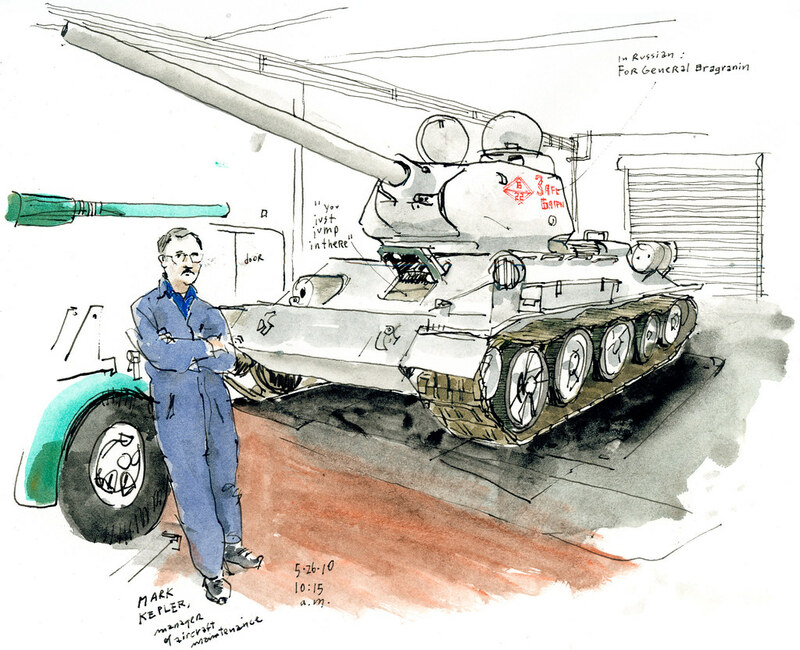 Mark Kepler, manager of aircraft maintenance, didn’t expect to be driving tanks when he started working here, but the veteran commercial pilot doesn’t mind changing gears. “I used to drive heavy equipment bulldozers and this is similar,” he said. The World War II tank has been re-militarized to fire blanks and painted snow white like the Red Army tanks that fought in Belarus in the winter of 1945, explained Adrian Hunt, the collection’s executive director. It was shipped to the U.S. from the Czech Republic, where someone had it stored in a barn, Hunt said, and it made a stop in Florida for an engine tune up before arriving to Seattle by truck in April. Curator Cory Graff said it’s a very important tank because of its design, which was used as a model for future tanks. “It’s the ’57 Chevy of tanks, it’s a classic,” he said. Monday’s military vehicle demonstration will also showcase a German tank destroyer, anti-aircraft guns and World War II jeeps and trucks from the Puget Sound Military Vehicles Club.